Everyone thinks their college is the best college. And while no college is outright BAD, some are certainly better than others. And from there, it reasonably follows that one college — and the town that makes it what it is — must be the finest of them all. Over the course of many tireless months working much harder than actual college students, we’ll be conducting our noble Search for America’s Best College Town. Now keep in mind, we’re not really talking about academics at all, and in some ways, even sports are only a small part of the formula. It’s the everything else — the bars, the burgers, the bars, the buildings, the lovable famous weirdos on the streets, the weather, the bars — that build a college town’s case. Get ready to re-enroll. Next up: Gainesville, home of the University of Florida. From party rafting and gator encounters, to drag racing and sunbathing coeds, here are 16 reasons why there’s no better college town in America. Maya Rudolph, Joaquin Phoenix, Against Me!, Sister Hazel (come on, that one song was catchy), Bo Diddley, Tom Petty, part of The Eagles — they all call G’ville home. And that doesn’t even count alums. Gator grads include Erin Andrews, Bob Vila, the dude fromOffice Space who wants his s-s-stapler (Stephen Root), and Wendy Thomas. Yes, of Wendy’s. Thanks to UF’s Beef Teaching Unit, anyone can purchase cuts of beef and pork for ridiculously low prices. Students from the university’s College of Agriculture learn the ways of the band saw while tending to the school’s herd. So many spots are iconic to Gainesville (Flaco’s, Dragonfly, Pizza by the Slice), but perhaps the greatest is Satchel’s Pizza, a hipster’s paradise where you can explore a junk museum before eating your pie in a freakin’ van! You know you’re getting close to Gainesville on I-75 when the billboards for the classy Café Risqué start popping up. Hell, they even have free trucker showers. Tigers, Vols, and Seminoles best not wear their game gear around the Swamp. In fact, our rivalry with the University of Georgia is so intense that the annual football game is played in neutral Jacksonville, where we throw what’s known as the World’s Largest Outdoor Cocktail Party. So you’re not all, like, “Dude, where’s my car?” after a night out downtown, there’s the late-night bus and van service that safely shuttles sloppy gators home. 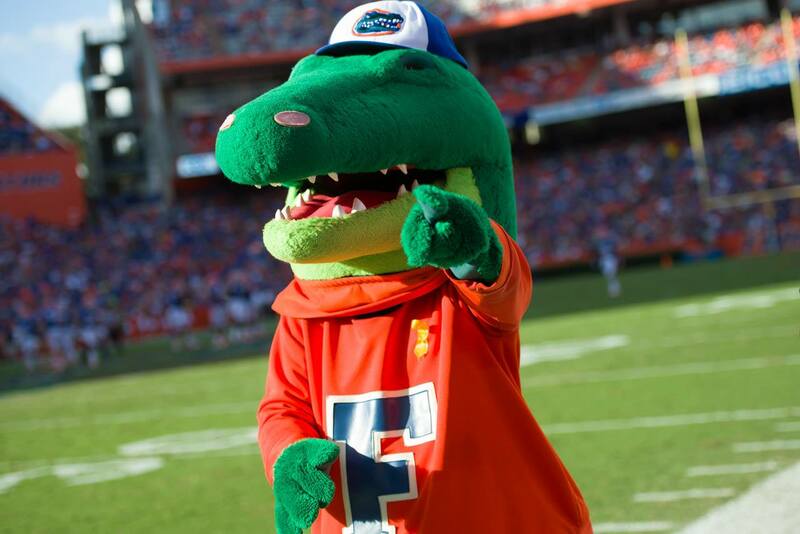 You haven’t truly lived until you’ve done the Gator Chomp by day, and vomited in the van by night. This entry was posted in Uncategorized and tagged best college town, gainesville, gainesville fl, UF, UF gators, university of florida. Bookmark the permalink.